Two separate programmes were held in Ahmedabad to observe the first anniversary of the gruesome Una flogging incident, which took place on July 11, 2016, amidst an unusual revelation that the floggers had planned to paint the four young Dalit victims as Muslims. Belonging to the Mota Samadhiyala village off Una in Saurashtra, the Dalit boys were tried with an iron chair, which in turn was tied with an SUV, and were beaten up while being paraded in Una town in full public view. 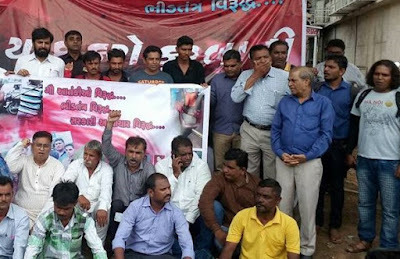 The first event in the forenoon was held at the Ahmedabad district collector's office, where a dharna was organized by the Gujarat Dalit Sangthan, a relatively little-known organization. The Dalit boys who were beaten up, along with their father, participated in the dharna, but refused to join the larger function held at the Ambedkar Hall in Saraspur. 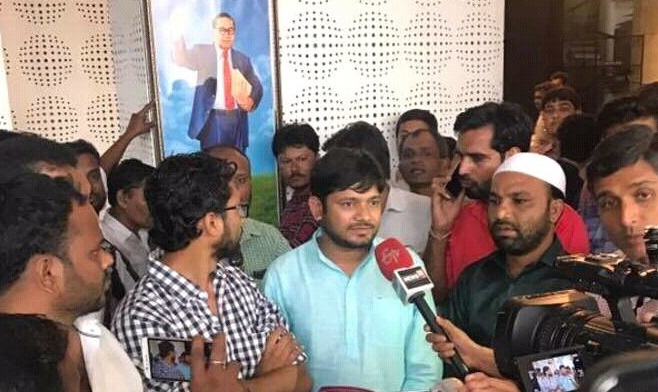 The Saraspur programme saw Gujarat's Dalit face Jignesh Mevani of the Rashtriya Dalit Adhikar Manch and Jawaharlal Nehru University student leader Kanhaiya Kumar address a jam-packed hall, which consisted of mainly Dalits and Muslims. Attacking government indifference, they called for a larger movement against "fascist attitude" of the Modi government. Dalits in villages around Una -- Mota Samidhayala, Ankolali, Motha, Dudhala, Samter, Thordi, Pipalva -- observed the protest day by tying black ribbon, demanding transfer of the Una flogging case to a special atrocity court for quick trial of the accused. Meanwhile, Mevani and Kumar, as part of their Una campaign, plan to go to Mehsana, a North Gujarat town, to lead Azadi Kooch or Freedom March, on Wednesday, for which permission, given last month, was cancelled two days ago. According to an organizer of the march, which is planned to end on July 18 in Dhanera, Banaskantha district with a big rally, activists from across India would court arrest if they are stopped. The Ahmedabad programmes were held even as controversy broke out following the revelation that the CBI chargesheet against the Una floggers was attached with a transcript of a video, revealing that accused had tried to identify the Dalits as Muslims. According to the Gujarati transcript, the accused tried call one of the victims as Muslim, saying, “Tell the truth … You belong to which community? Don’t do drama here … stop crying … Beat him up. What is your name? I know you very well … Your name is Aarif … Why did you run away? Tell me will you ever run away? You slaughtered the cow.” It adds, “Let us tie them to the vehicle and thrash them. Only then will they understand." The chargesheet identifies mastermind of Una flogging as Sanatan Gau Seva Trust's Shantilal Monpara, who allegedly hatched a conspiracy with his aides to claim that the Dalit men had slaughtered the cow should be identified as Muslims. The Dalits were actually skinning a cow, their hereditary occupation, killed by a lion. Meanwhile, the view has gone strong among Dalits in Saurashtra that justice has not been delivered to the Una flogging victims. Gujarat's largest Dalit NGO Navsarjan Trust's Kantilal Parmar says, "The Gujarat government has refused to transfer case to the special atrocity court in Veraval, though one year has passed." Listing what has not been done to the Sarvaiya family and other Dalits in the hereditary occupation, Parmar says, the government has "not allocated agriculture land for livelihood of the surviving family", nor has it allocation land for "burial ground in Mota Samdhiyala village to the Dalits for cremation", as the dominant caste people do not allow them use the common village cremation ground. Pointing out that the state government has not done "proper rehabilitation of the victims' family, Parmar says, "Nor has the state government provided employment to the unemployed Dalits after many of them decided to quit their routine work of skinning dead cattle."